I arrived home just after lunch time today from my daughter’s netball match, only to find the power off. And when I rang the electricity fault line there was a recorded message to say that the power was going to be out until 8.00 p.m. So even though it was freezing cold outside (7 degrees C), I decided to head out and activate a park, and listen to the footy on the radio on the way. I chose to go to the north east as the weather looked a little kinder in that direction. There were predictions today for hail and possible snow in the Adelaide Hills where I live. 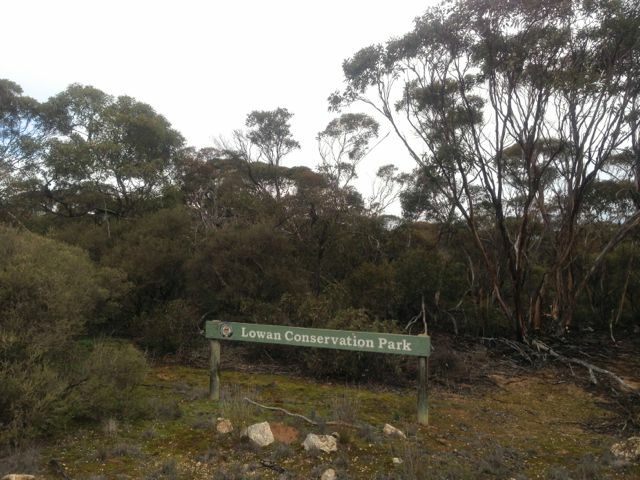 I chose the Lowan Conservation Park, which is about 130 kms north east of Adelaide, near the town of Bow Hill. This is about an hours drive from my home. I entered the park via Gribble Bore Road, which runs off the Bow Hill Road. 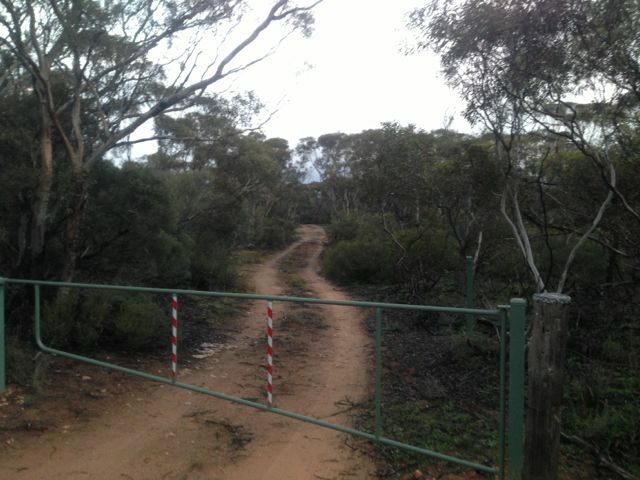 I found a gate and a track on the southern side of Gribble Bore Road, and drove about 200 metres into the park, and parked the car amongst the mallee. The Lowan Conservation Park is about 660 hectares in size and is located about 15 kms south of Bow Hill, a little town situated on the Murray River. Lowan Conservation Park is a reserve of remnant mallee scrub in the midst of wheat and sheep farms. The park consists of thick mallee scrub and areas of native pine and open grassland. Numerous bird species can be found in the park, including the Malleefowl, which is an endangered species. Malleefowl are also known as Lowan, and the park derives its name from the bird. Western grey kangaroos are also common and it is a good place to see short-beaked Echidnas, and fat tailed dunnarts if you are lucky. There are no marked tracks in the park and the mallee is very thick in parts, so a compass or GPS device is definitely needed. There are no facilities and no marked campground. 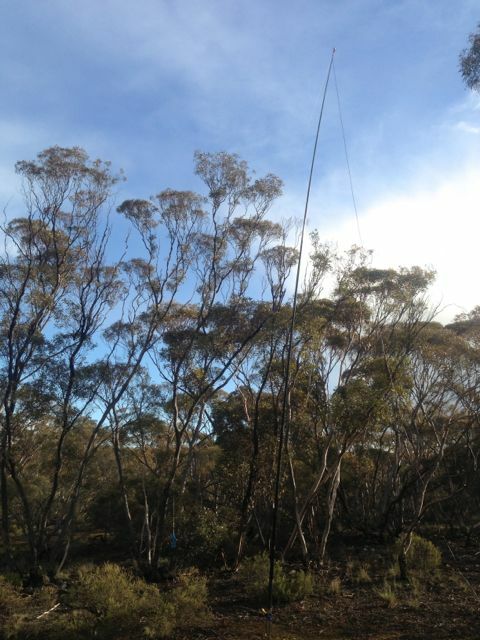 I set up the dipole supported by the squid pole in a clearing amongst the mallee. The soil was very sandy so I was able to hammer in the squid pole holder and secure the squid pole to it with an octopus strap. There was no shortage of trees here to tie off the legs of the dipole. I turned the radio on to 7.100 and asked if the frequency was in use, only to be answered by Brian VK5FMID who was my first contact of the day down in Mount Gambier. 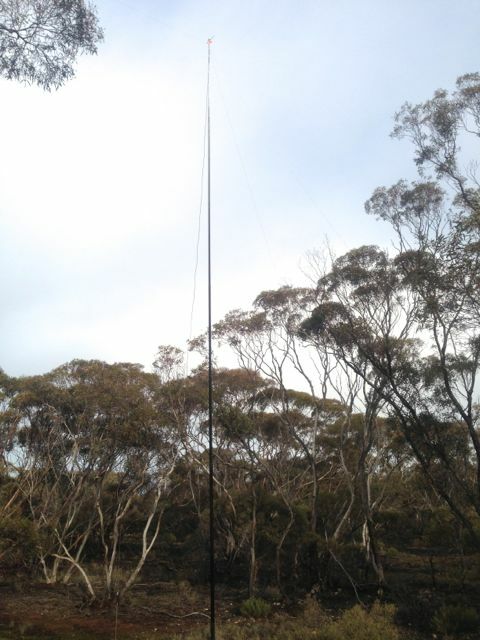 I also spoke with Phil VK3BHR who was activating his first SOTA peak, on Mount Tarrengower, VK3/ VN-023. Phil had a good strong signal of 5/8. I managed one DX contact into New Zealand on 40m with Lamont ZL2ALK. Lamont was an excellent 5/9 + and I received a 5/4 back and was very happy with that. I stayed until the sun started to go down. 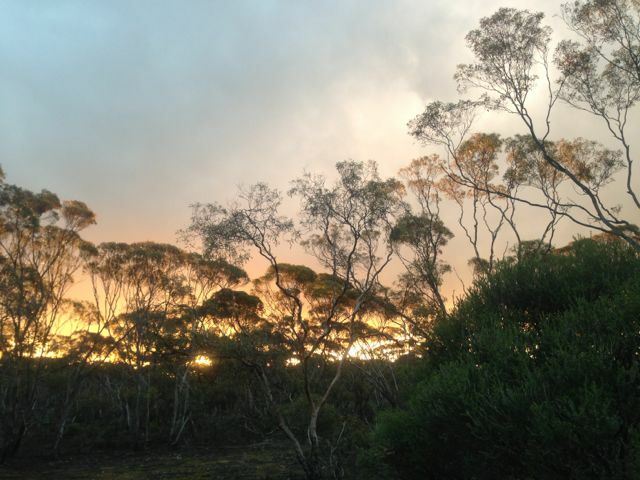 ,The minute the sun started to set behind the gum trees, it was getting absoultely freezing. My thermometer was showing 4 degrees C.
I ended the day with 29 QSO’s into VK1, VK2, VK3, VK5, & ZL, all on 40m SSB The following stations were worked:- Brian VK5FMID; Ian VK5CZ; Col VK5HCF; Ron VK3AFW/m; Paul VK5PH; Nev VK5WG; John VK5FMJC; Robin VK5TN; Graham VK5GH; Brenton VK5FBJD; Tom VK5EE; Dale VK5DC; Greg VK3GRW; Allen VK3HRA; John VK5FTCT; Bill VK5MBD; Frank VK3GFS; Phil VK3BHR/p (SOTA); Matt VK1MA; Ron VK3AFW; Mal VK3AZZ; Roy VK5NRG; Colin VK3UBY; Brian VK3MCD/m; Bill VK3LY; Gerald VK2HBG; Urey VK3ATA; Lamont ZL2ALK; & Pete VK2QG. Luckily the power had come back on by the time I got home and I enjoyed a nice hot bath and a few glasses of red.